Welcome to Day 4 of #BrunchWeek hosted by Terri from Love and Confections and Christie from A Kitchen Hoor’s Adventures. Let’s talk about brunch. Everyone knows that brunch is a combination of breakfast and lunch foods but I believe it should also be a good combination of sweet and savory foods. Most of the foods I make when I do a brunch are sweet foods like muffins, coffee cake, and fresh fruit. However, there is one savory dish my brunch table is never without and that is some sort of egg bake. 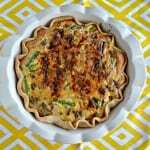 eggs, cheese, and any veggies or meat that you have in the refrigerator. 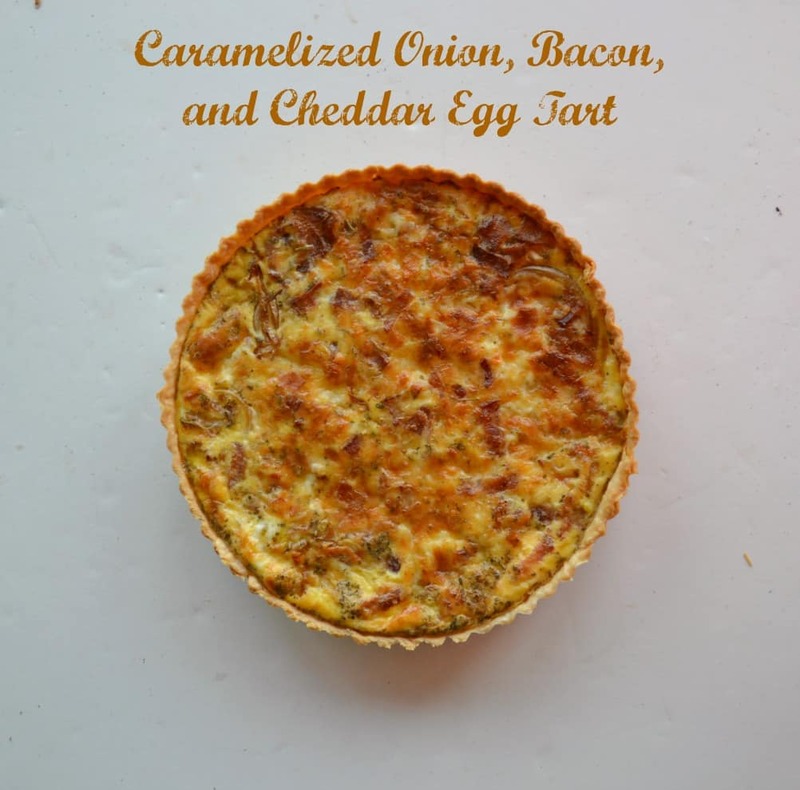 Since I make quiche all the time I wanted to make something a bit different but still egg based. I decided on an egg tart! quiche I have an equal egg to milk ratio when I pour it in the pan. 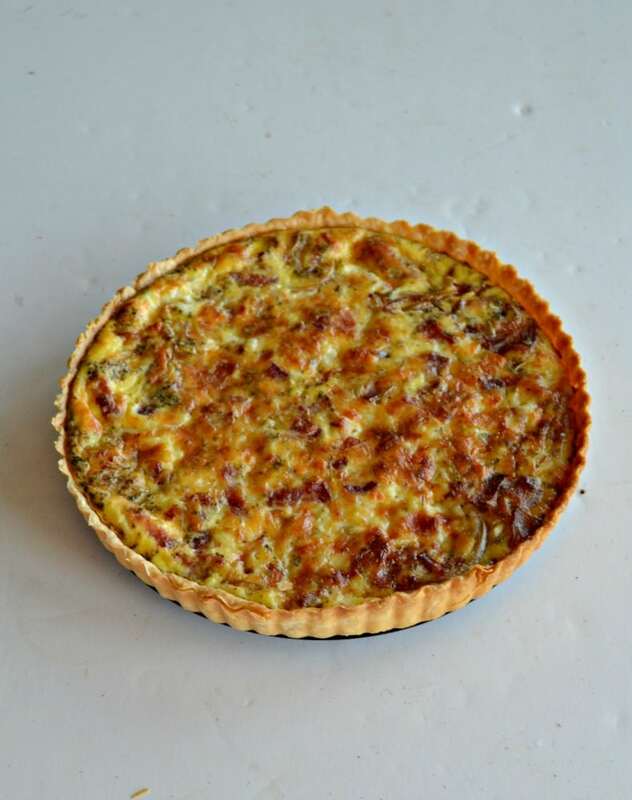 With a tart it’s mostly egg and just a little bit of milk to thin it out. 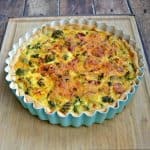 I also tend to use fewer ingredients in a tart then I would a quiche. 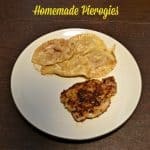 This recipe has 3 basic ingredients besides the eggs. I used Vidalia onions, bacon, and Cabot Seriously Sharp Cheddar Cheese. I always like to cook vegetables before putting them into an egg bake and instead of sautéing the onions I caramelized them. Vidalia onions are the perfect onions to caramelize because they are already a little bit sweet. caramelize these onions. I actually think this made them caramelize faster which was nice. I added the onions, crumbled bacon, and shredded cheese to the egg mixture then added in a few spices. You can use whatever spices are your favorite but I used rosemary and marjoram. do with a pie pan. It just makes it a bit prettier. and sharpness of the cheese was absolutely delicious. 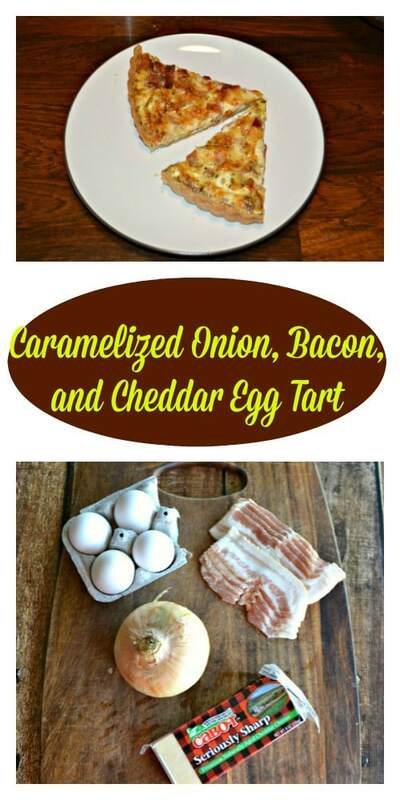 A delicious combination of eggs, caramelized onions, bacon, and cheddar cheese baked in a flaky crust. Cook the bacon in a large skillet over medium heat until crispy. Remove from pan and place on a paper towel lined plate to drain. Crumble when cooled. Remove all but 1 tablespoon of bacon grease from the pan. Add the onions and sugar to the pan and cook over medium low heat for 10-15 minutes, stirring occasionally, or until onions have caramelized. Remove the onions from the pan and refrigerate for 10 minutes to cool. Meanwhile, place the pie crust in the tart pan. Gently press it into the pan and remove any excess dough. In a large bowl combine ⅔ cup of cheese, eggs, and milk. Mix well. Add in the rosemary, marjoram, and pepper and stir until combined. Sprinkle almost all of the bacon in the bottom of the tart pan. Spread the caramelized onions on top. Pour the egg mixture on top of the bacon and onions. Sprinkle remaining cheese and bacon on top. Bake for 30-35 minutes or until the top has browned and the egg is cooked through. Remove from the oven and cool for 15 minutes. Carefully lift the bottom out of the tart and away from the sides. Cut the tart and serve warm. 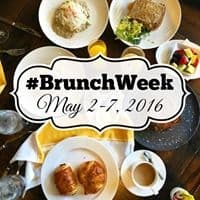 Don’t forget to enter the #BrunchWeek giveaways! 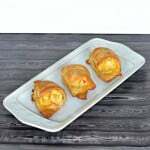 Click over to my Apple Cheddar Scones post to see a detailed list of prizes. Fill in the Rafflecoptor below to enter! Your tart filling sounds scrumptious! Perfect ANY time of day! Those onions caramelized are almost like candy. I can’t wait to try this. 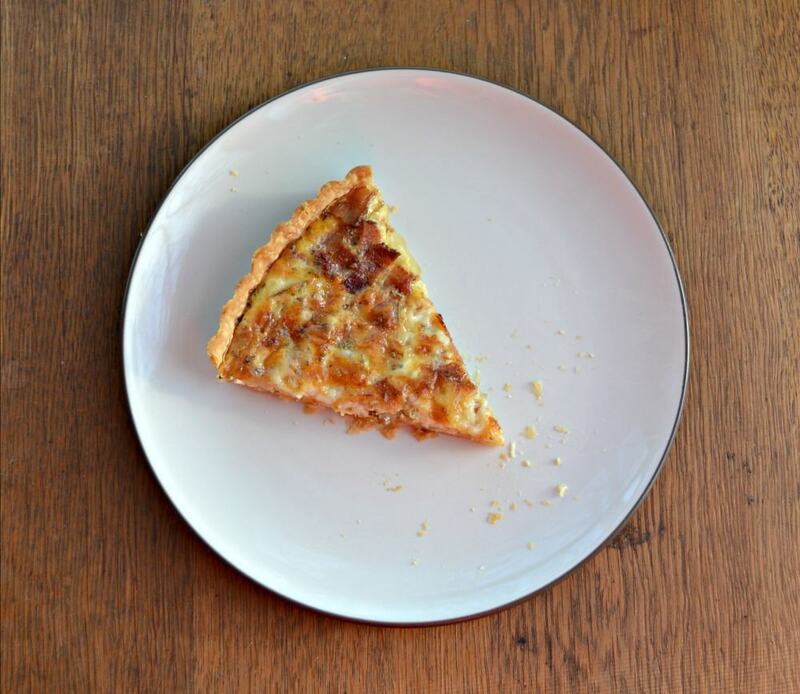 Quiche is always the perfect brunch dish. I love this wonderful tart.